The immune system is the most important factor of the human body. Especially for the kids, who easily falls sick with the effect of weather changes, environmental changes and frequently visit to doctor. In other ways, getting sick is simply a part of your job description. For all this, a strong child immune system helps to fight against all the changes occurring in the body and helps them to gain a greater level of wellness. You can take some precautionary measures to ensure that your child fights with all the changes and also to keep them healthy and happy in the future. Giving the perfect immunity enhancing antibodies from the time of their birth can help the baby fight against all odds and sickness. Research has shown that breastfeeding your babies can help build them a stronger immune system and protects them. The thick yellow pre-milk after the delivery contains immunity enhancing antibodies which are a life-saving ingredient for them. Not only this, breastfeeding helps fighting against many infections, like allergy, sensitivities and helps in building better brain power as well. So never miss an opportunity to breastfeed your baby right after the delivery and as long as it is possible. 2. A great diet is the secret of good health. A complete and protein-rich diet supplements are very important in order to build a stronger immune system. The meal should have a combination of 4 to 5 fruits and veggies per day. Carrots, beans, leafy vegetables and fruits like oranges, strawberries, and apples contain immunity boosting ingredients which help to fight against many ailments. 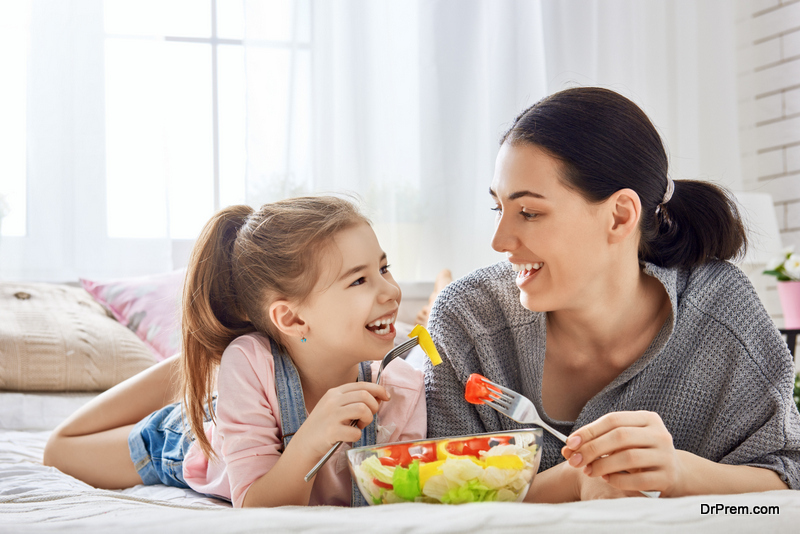 Including all this in your daily diets can really help your child to build a strong body and fight against chronic diseases such as heart issues and cancer as well in their future. If your child loves meat and eggs, provide them with Boiled eggs. Make a habit to get them all these protein-rich food items in their daily diet so that they get used to it. A strong immune system helps fighting against all the serious and life-threatening diseases. 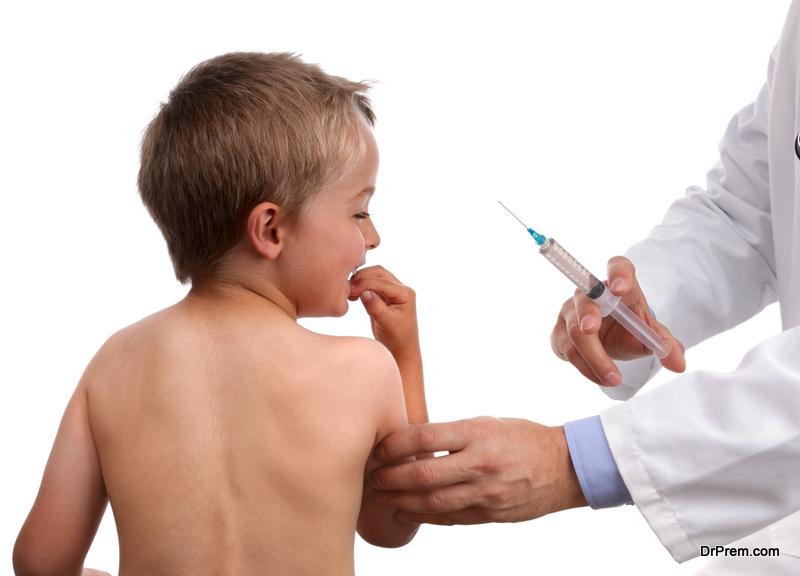 For this, vaccination is very important and it should be given at a prescribed time. 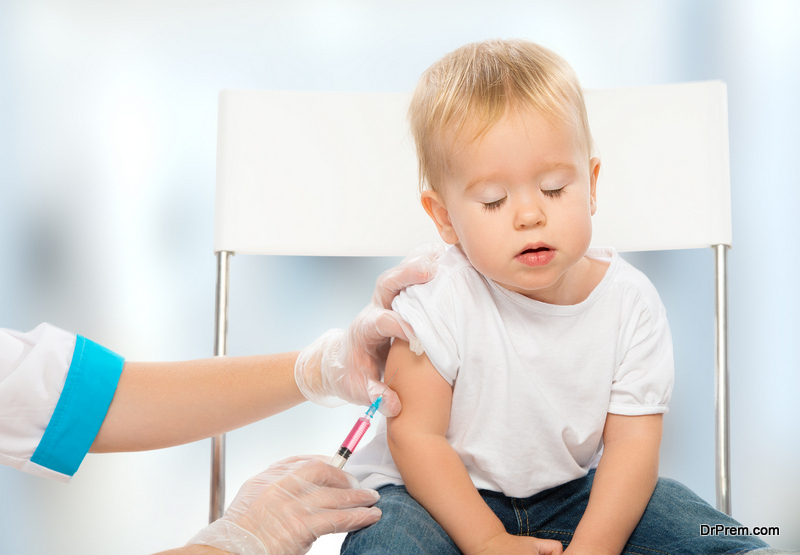 Vaccination starts as soon as your baby comes in this world till the time they become 5 years of age. Sometimes because of the busy schedule, parents miss the vaccination time, for this, you can follow the apps which lets you remind about the next vaccination and alerts you in advance for the next doctor’s appointment. In this way, you will never miss a session and can keep your kids vaccination schedule up to date. Make a habit of involving outdoor play and activities in your kid’s schedule. 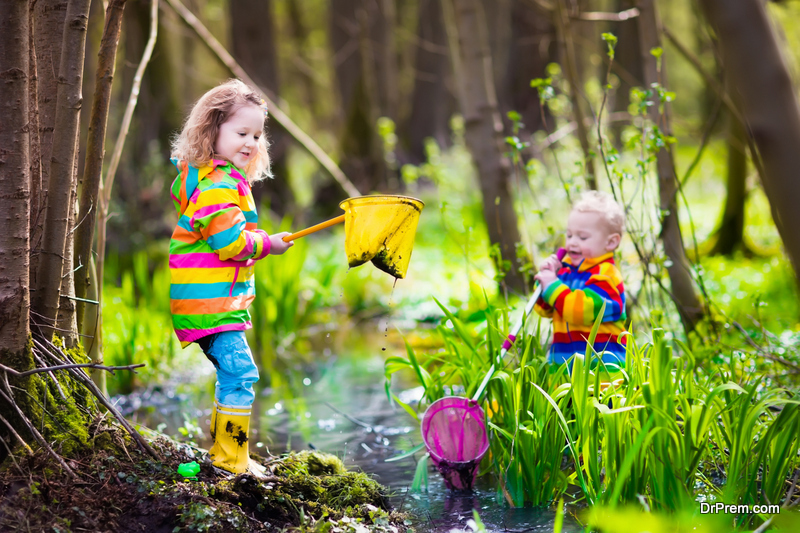 Playing outdoor, exercise and exploring new activities and playing with their friend helps boost immunity. It makes your kid’s body and soul active and lively. There is some great result of involving exercise and physical activities in their daily routine. Exercise and physical activity helps boost immunity and make their body stronger and sharper. It does not only help in physical development but also provide mental growth, sharpness and the perspective of looking at things. Make a schedule and ensure that your kid plays outside and include exercise at least for 1 to2 hour You can also have a walk with them to the park if they are not in a mood to play. Fresh air helps in making a healthy well being. At last, let them do some activities as they wish to do. Do not keep an eye for every minute of your child’s day. Let them give freedom and explore the things they wanted to. A proper amount of sleep is very important in order to get your kid’s body to prepare for the routine and fight against diseases and infection. Make sure that your kids get enough sleep to make the body strong and fresh. Create a routine that they go to bed at the right time every night and have at least 10 hours of sleep. Yes, 10 to 12 hours of sleep is what every child needed because their physical activities are double as of adults and thus they need more sleep time than the older human being. Parents often get tensed as soon as their kids fall sick. They wanted to get the cure as soon as possible; and hence they provide them with antibiotics to get them treated early. Antibiotic helps to kill bacteria in the body and it is useful for sure. But a regular dose of antibiotic is not good for the child. Instead, you can try some home remedies and dietary supplements to treat your child infection or why not include them in their daily life as a precautionary measure. There are numbers of tried and tested remedies to improve Childs immunity. Amla and tomatoes are rich in vitamin c; and provides enough of iron in the body, this helps in the improvement of the immunity level. 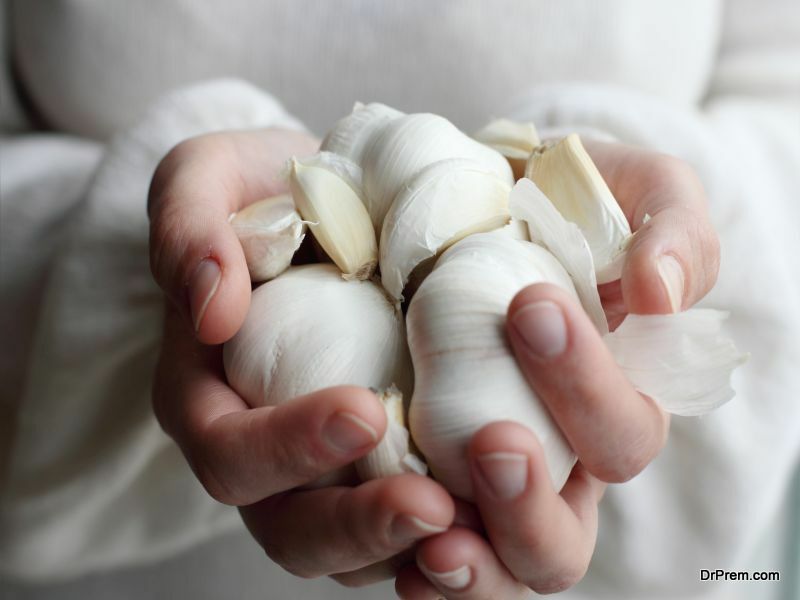 Add garlic and ginger to everyday cooking as it helps fight against diseases. One of the super foods is the Tulsi leaves will not only fight infection; but also makes the body build immunity against many viruses.